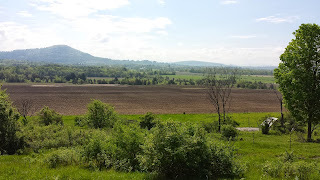 Early on a beautiful Sunday morning, I packed up and headed out on a 60 mile trip. It was a personal range record. I planned it carefully (perhaps more so than necessary), making sure I had calculated my energy budget and arranged for basic contingencies. Tools, Spare tube, charger, good nav, etc. I rode on the amazing Champlain Bikeway down to the Basin Harbor Club. Although it was somewhat chilly when I left, by 10am it had warmed to the mid-70's, and continued to heat up throughout the day. Besides being a little overdressed, everything worked perfectly. I was maintaining a very steady 17 mph, and lightly pedaling about half the time. This resulted in an average of about 18 watt-hours/per mile, which was very conservative. At the halfway point, I had used about 40% of my ~1300 wh battery pack. At the 30 mile half-way point, the bike and I rested comfortably beach-side at the Basin Harbor Club. When I arrived at the Basin Harbor Club's beach, two enthusiastic young staff members ogled my bike, and we talked at length about the build. 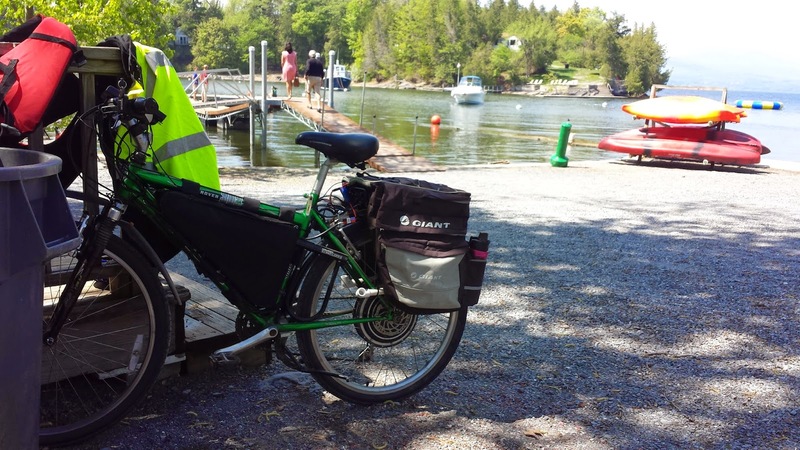 As luck would have it, they had recently taken delivery of 10 fleet electric bicycles for the purpose of rentals for the guests. I got to check them out - they were Evelo Auroras; 250 watt mid-drive models with NuVinci hubs. 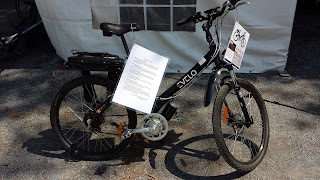 I was really impressed - lightweight, versatile, and an excellent choice for the uninitiated electric bike user. Plenty of torque, and a top speed of 25 miles an hour (with pedaling). On my way home, I stopped for lunch and chatted with a few diehard hard road-bike folks. Fully outfitted in their exercise gear, they commented that I "must be hot in that jacket and long pants". I tried to explain to them that it was useful for higher speeds, in terms of safety and staying warm, but I'll be honest - it was difficult to explain. Continuing, on I stopped at my friend Steve's place, the ADV garage, and got to do some cool work on a BMW motorcycle project that he had going. Finally, I was on my way back home. Throughout the trip I did quite a bit of pedaling, in fact much more so than I really needed to. 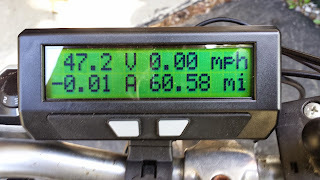 By the time I got home, even though my 52v battery pack was just under 47 volts, I still had almost full power at wide open throttle. It's difficult to determine how much further I could have gone, but I was definitely not out of energy by any stretch. Wind and terrain make a huge difference in how much energy you will use in a trip. If there is wind or hills, it will reduce your efficiency - either on the way there, or on the way back. Regen braking and/or a tail wind can help, but they will never fully compensate for the efficiency losses in the other direction. Also, the most limiting factors in the practicality of a long trip actually come down to things that are not technical at all - Mainly, saddle soreness and chaffing. By the time I got home, I wasn't laughing at those road bike guys' outfits at all.